Oh my poor daughter. A week's worth of April vacation and she didn't get to go anywhere. Literally the only time we went out was to her orthodontist appointment on Monday and I couldn't even buy her lunch afterward because I left my wallet at home. After that my wife and I got sick and the week was pretty much ruined. We find an open Friendly's and are quickly seated. We're both hungry and make short work of the dessert menu. My daughter wisely chooses the Oreo Sundae. It was only like $2.19 but it looked great and she finished every bite. As for me? Well, I need to try something new on the menu. 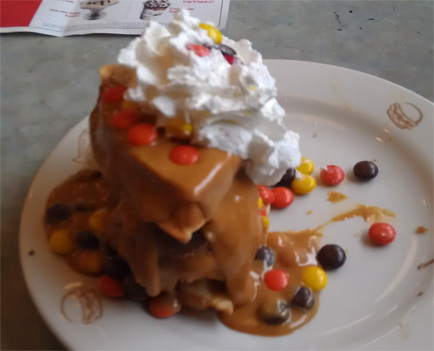 My friends, there are five new waffle dessert on the menu: Nutty Caramel Waffle Sundae, Chocolate Supreme Waffle Sundae, Reese’s Pieces Explosion Waffle Sundae and Strawberry Cheesecake Waffle Sundae. Their is a fifth option and it's a "Build-Your-Own" variety. The funny thing is that it's now called a Waffle Sandwich, not a sundae. (Actually the funny part is that we just saw the Food Truck episode of Man v Food Nation and they covered a waffle truck where people often fold up their waffles to make a sandwich). It took all of 7 seconds to pick which one I wanted. Ok, ready to get hungry? I'm pretty sure they used an entire pack of Reese's Pieces on top. I can't wait to bite into that fresh ice cream and crisp hot waffle and.... wait, this waffle ain't crisp, or hot! Hey, grrrr, I want one that's hot and fresh off the waffle iron, get back here and fix this right now! Ok, I would never say that, but I was disappointed right off the bat. Factor in an overly dry peanut butter sauce and we've now got two strikes against us right from the get go. Good points? The peanut butter ice cream seems to be very good. It's a rich peanut butter colored ice cream with huge chunks of Reese Peanut Butter Cups on top. I'm digging the Reese's Pieces too, but there are just so many of them. I hate to complain about getting too much of something, but it really is excessive here. The whip cream is fine and I actually appreciate it's cold fluffiness in contrast to the dry sauce. Well, in today's battle of Man vs Food, Food obviously wins as witnessed in this parting shot of my plate. Had they thrown in a third scoop of ice cream and then also served me a truly hot, fresh, crisp Waffle, then, and only then, this may have truly rocked my world. I was very full at the point of the picture above, but it was more of a peanut butter overload fullness instead of a truly satiated (and happy) fullness. I mean, come on, look at all the peanut butter sauce still on my plate. 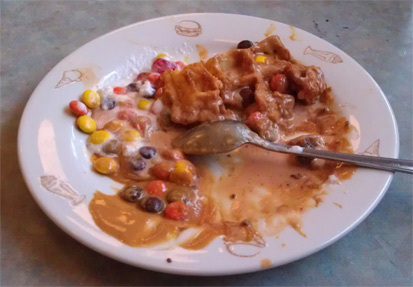 I could care less about not finishing the waffle, but I admit that I sat there for about 5 minutes staring at the Reese's going "this is such a waste, I need to finish these". Good heavens, I want this right now! Sorry dude, but sometimes the picture makes words irrelevant. If there was a Friendly's near me, there is absolutely nothing that would stop me from devouring this entire thing. The idea of too much peanut butter simply does not compute. if you think that lava cake was overboard, then even you are in for a shock my friend. This was $4.99 of death by peanut butter. agreed, the waffle sundaes and the lava cakes can easily be shared. HA! I sure am catching a lot of flack for this one, but hey, I understand everyone's skepticism. I thought the parting peanut butter puddle picture would convince everyone, but apparently not! I thought this was caramel when I first saw the pic. When you mentioned it was peanut butter I was impressed you were able to eat as much as you were! Way too much pb! HA! darn it! I knew someone was going to chime in with that one! How about I would have been happy with a warm waffle.... actually I would have been happy with a crisp waffle. I just got frustrated because it felt like someone pulled in from the fridge, microwaved it for 10 seconds to shake off the cold, and then threw it on my plate. haha, yeah - damp/lukewarm waffle does not sound appealing. New Bryer's flavor for you to try, Strawberry Waffle Cone (or something like it). Saw it in Walmart yesterday and as always thought of this blog! I have been anxious to try this sundae, myself. 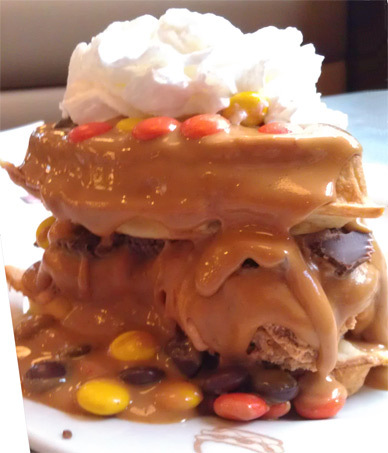 I love peanut butter & I love waffles, and my favorite treat is Reese's anything--so I thought this sundae would be HEAVEN! When I got done, my plate looked EXACTLY like yours! Whoa, the peanut butter was so over the top. I thought I was going to throw up because of the peanut butter. And my waffle was fresh off the waffle maker, warm and golden and crisp..it did NOT make up for the ridiculous amount of peanut butter! hehehehe, it's a mighty dessert isn't it? I'll never do that again!